Well January zoomed by so fast that I forgot to blog about or link up my January finish. Which makes me super sad as I did finish it and gave it a mini photo shoot and everything! I'll give it a post of its own later but here's a little sneak peek of it and then we'll move on to my February goal. For February's goal I've chosen this fun little hexie project I've been working on. It's a gift for someone who loves red and orange and I added blue for balance and pink on a whim. I think these colours will be well received! The hexies are English Paper Pieced and each side finishes at one inch. I like to thread baste my hexies and sew them together with a whip stitch. The panel is already hand pieced and machine quilted with closely spaced straight lines which is (and I think will always be) my favourite way to quilt! I love the texture it creates. All that's left is to turn the panel into a little throw pillow and with a freshly serviced sewing machine and a new zipper in stock that won't take me long at all! 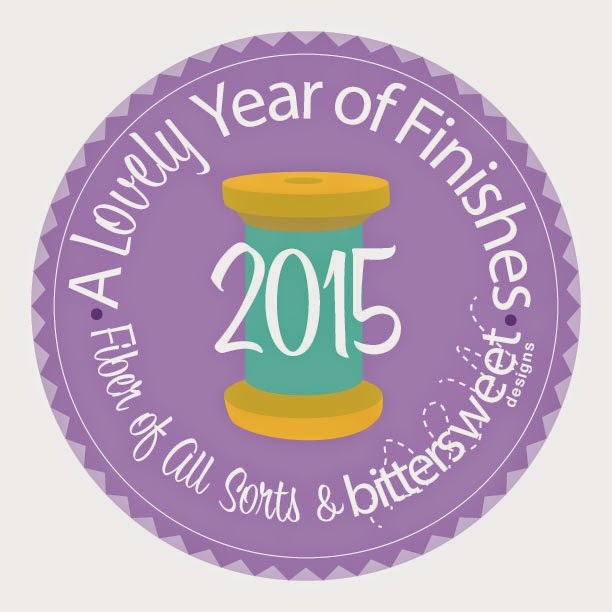 Linking up to A Year of Lovely Finishes! Looking lovely. Hooray for a quick finish. That will be a lovely finish for February since it's a such a short month. Amazing isn't it, how just 3 days less and February seems to slip by... we're already 1/4 the way through. I look forward to seeing the finished pillow. Love all the bright colors in your hexies. It's gorgeous.